Objective: The aim of this study is to describe the technique and to evaluate the outcome of single-incision laparoscopic (SILC) approach for linea alba hernia in children. 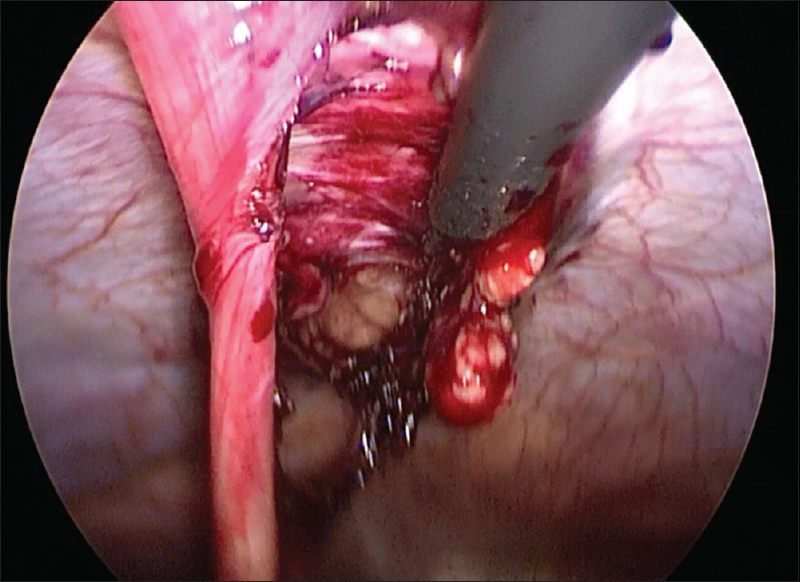 Materials and Methods: A 2 cm vertical umbilical incision was made and stretched horizontally. A 5-mm trocar was inserted through middle port for the telescope. Another extra-long 5-mm 30° trocar was inserted through the lateral port, 5 mm beside the middle port. The extraperitoneal fat was removed, and the defect of linea alba was repaired after hernial sac was excised. The peritoneum was reconstructed with interrupted suture. Results: From May 2014 to May 2015, eight children with linea alba hernia underwent SILC. Pre-operative abdominal ultrasound showed the average diameter of hernia ring was 3.2 ± 0.7 cm. Mean operation time was 32.5 min (range = 30–45 min). Oral intake was resumed during anaesthesia recovery period. All could endure pain and discharge on the post-operative 12 h. There was no post-operative wound infection. The follow-up period was 1–12 months, no recurrence and other complications occurred. Conclusions: SILC approach for linea alba hernia is a safe and effective, minimally invasive new technology. The linea alba hernia could be repaired with a cosmetic outcome. Linea alba hernia is meant those small protrusions, usually not larger than a walnut, situated in the linea alba between the umbilicus and xiphoid cartilage. This form of hernia is rare, occurring in not >1% of all hernia. Morbidity in children is lower., It occurs much more frequently in male than female. It usually contains omentum and rarely a portion of the transverse colon. Many of the cases develop slowly and insidiously, and suddenly give rise to symptoms. The main type of surgery is still open surgery now. Minimal invasive technology has been widely utilisable in the management of a various hernia. Our centre set up a single incision laparoscopic (SILC) for linea alba hernia according to the paediatric trait of development of abdominal wall. Eight children with linea alba hernia who underwent SILC were enroled from May 2014 to May 2015. Eight cases with epigastric hernia were enrolled into this study which included 5 males and 3 females. Age ranged from 2 months to 4-year-old, with a mean age of 1.8-year-old. The most common clinical presentation was epigastric mass. Epigastric pain was localised and mild, aggravated by exercise while alleviated through rest. Nausea and vomiting were accompanied with abdominal pain in some cases. The incidence of incarcerated hernia was low which is accordant to the data abroad. On physical examination (PE), the reducible mass was commonly found without obvious tenderness. Hernia ring (3/6, 50%) could be found in some cases. Ultrasound is helpful to diagnose this condition,, as shown in [Table 1]. It is important to mark hernia location pre-operatively because linea alba hernia is difficult to find once the patient is under general anaesthesia. A nasal gastric tube is placed before anaesthesia. General anaesthesia combined with intubation is used. A 2 cm vertical umbilical incision was made and stretched horizontally. A 5 mm Trocar was inserted into open type to establish pneumoperitoneum. This trocar was for the telescope. CO2 pressure was maintained between 8 and 12 mmHg. A 3 mm lateral subcutaneous port was made through right rectus abdominis for another extra-long trocar to deliver instruments, 5 mm beside the middle port [Figure 1]. The abdominal condition, hernia sac, hernia number, adhesion and hernia content were observed through telescope [Figure 2]. Abdominal wall suspension was necessary by using 2-0 needle thread if the patient had bowel distension or small abdominal space. The extraperitoneal fat was cleaned after the hernial sac was resected [Figure 3]. The defect of linear alba was exposed and repaired [Figure 4]. Bilateral linear alba were dissociated and interrupted sutured by using 2-0 needle thread after hernia sac was excised [Figure 5]. Eight cases were enrolled into this study from May 2014 to May 2015. All of the patients were successfully underwent the SILC surgery. Mean operative time was 32.5 min with a range of 30–45 min. No bleeding of operation was found which resulted in a fast recovery. They were allowed to eat after awake of anaesthesia. The pain was tolerable. The patients discharged after surgery with an average time of 12 h. Follow-up was ranged from 1 to 12 months. There was no post-operative complication, such as a recurrent hernia, ileus and infection. As previously stated, linea alba hernia is usually in asymptomatic condition, especially in paediatrics due to the unclear complaint. It is reported that linea alba hernia caused chronic abdominal pain in children. It is speculated that there are numerous linea alba hernia patients who have been neglected, even have been diagnosed or treated as other diseases, such as pancreatitis and myocarditis, leading to delay of treatment and waste of medical resource. Compared to an adult, paediatric patients have those features below: (1) Subcutaneous fat in children is thin which contribute to hernia ring or subcutaneous mass could be palpated on PE. Early diagnosis is easier to make than adult. (2) Giant linea alba hernia is rarely seen in children. (3) Paediatric patients normally do not have concomitant disease which leads to the high pressure of abdomen. Paediatric abdominal muscle and fascia have more flexible ductility which result in low local tension after repair surgery. Overlapping suture and mesh repair are less required. Majority of surgeons agreed to treat linea alba hernia earlier to avoid the severe situation. The operation is the first choice for linea alba hernia. The vertical epigastric incision is a traditional method to expose linea alba to detect multiple hernia while the disadvantage of this surgery is more invasive. SILC is widely used in many situations of paediatric abdominal diseases followed by the development of minimally invasive technique.,,,, We suggest treating linea alba hernia by trans umbilical SILC surgery according to paediatric patients' trait. 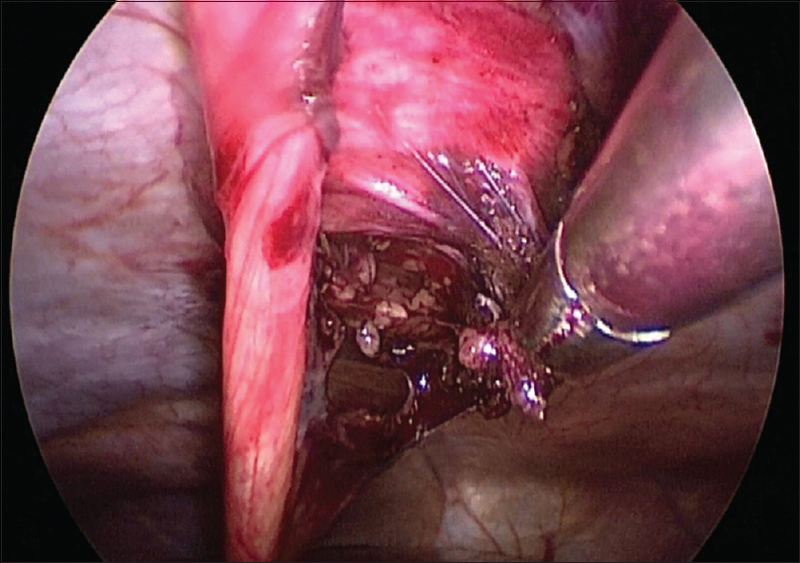 Highlight for this surgery include: (1) Incision of trans umbilici is conceal and scarless, secondary to less invasive and less pain; (2) adhesion of hernia content can be observed directly through laparoscope during the procedure of losing adhesion; (3) multiple linea alba hernias could be detected during the surgery without another incision and can be treated at the same time; (4) repair surgery can achieve complete repair due to anatomical structure of linea alba hernia is fully revealed under laparoscope; (5) in our centre, open surgery through umbilical incision was also performed in children with linea alba hernia, especially when the hernia was 3 cm superior to the umbilical ring, it is difficult to repair the hernia ring. The study provides another option for the larger hernia. Eight cases of linea alba hernia were treated by SILC in this study. There were significant differences in surgical time with open surgery while bleeding volume, admission day and post-operative complication was not different compared to open surgery. Special surgical apparatus is not necessary for SILC and procedure is not complicated to learn. Shorter time would be used to manage this skill if there is some foundation for laparoscopic technique and theoretic training. Many kinds of abdominal diseases were treated by SILC before we start this surgery., Narrow space, the difficulty of the exposed surgical field could be solved by 180° of rotation of laparoscope. SILC is a reasonable method for linea alba hernia in the paediatric patient. Incision could be made trans umbilici result in less invasive and scarless. The operation is started from the inner layer of the abdomen to achieve a complete repair. No special apparatus is required. Linea alba hernia treated by SILC is recommended by our centre because of safe, effective and minimally invasive. In clinical practice, linea alba hernia repair (umbilical ring within 2 cm) and SILC linea alba hernia repair (umbilical ring on the margin of 2 cm above) could be flexible selected depending on different indications. We would like to thank those patients who supported our study and authors who provided us with the full-text. Kelly KB, Ponsky TA. Pediatric abdominal wall defects. Surg Clin North Am 2013;93:1255-67. Burcharth J, Pedersen MS, Pommergaard HC, Bisgaard T, Pedersen CB, Rosenberg J, et al. The prevalence of umbilical and epigastric hernia repair: A nationwide epidemiologic study. Hernia 2015;19:815-9. Dai GR, Jiang L, Cheng LY. Analysis on diagnosis and treatment of white line hernia. J Reg Anat Oper Sur 2014;23:22-4. Babsail AA, Abelson JS, Liska D, Muensterer OJ. 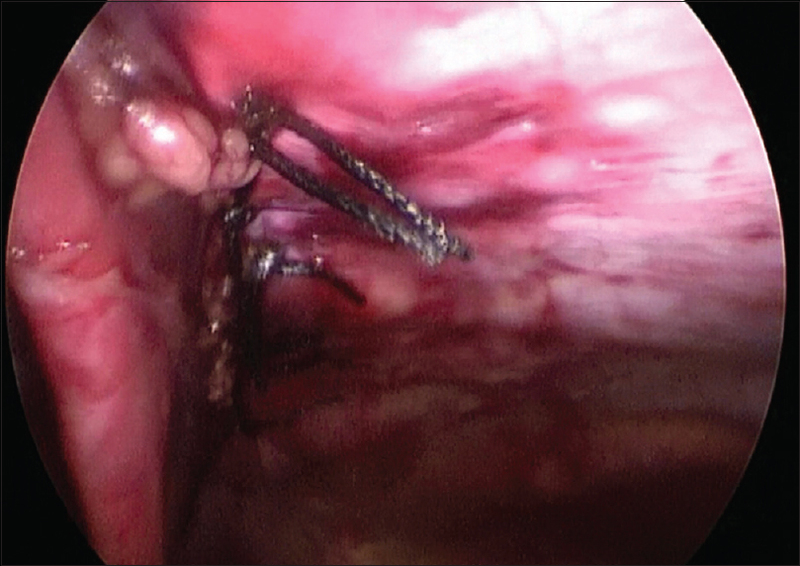 Single-incision pediatric endosurgical epigastric hernia repair. Hernia 2014;18:357-60. Bugenstein RH, Phibbs CM Jr. Abdominal pain in children caused by linea alba hernias. Pediatrics 1975;56:1073-4. The value of high frequency color Doppler ultrasound in white line hernia. Clin Study Med 2006;23;608-9. Li Y, Liu AQ. High frequency ultrasonographic diagnosis of hernia of linea alba. J China Clin Med Imaging 2005;16:465-6. Lianglu L, Binrong Z, Chang ZS. Surgical treatment of white line hernia. J Physician Educ 2001;24:23. Rothenberg SS, Shipman K, Yoder S. Experience with modified single-port laparoscopic procedures in children. J Laparoendosc Adv Surg Tech A 2009;19:695-8. Hansen EN, Muensterer OJ, Georgeson KE, Harmon CM. Single-incision pediatric endosurgery: Lessons learned from our first 224 laparoendoscopic single-site procedures in children. Pediatr Surg Int 2011;27:643-8. Chow A, Purkayastha S, Paraskeva P. Appendicectomy and cholecystectomy using single-incision laparoscopic surgery (SILS): The first UK experience. Surg Innov 2009;16:211-7. Tam YH, Lee KH, Sihoe JD, Chan KW, Cheung ST, Pang KK, et al. Initial experience in children using conventional laparoscopic instruments in single-incision laparoscopic surgery. J Pediatr Surg 2010;45:2381-5. Diao M, Li L, Dong N, Li Q, Cheng W. Single-incision laparoscopic Roux-en-Y hepaticojejunostomy using conventional instruments for children with choledochal cysts. Surg Endosc 2012;26:1784-90. Zhang JS, Li L, Diao M, Hou WY, Liu SL, Zhang J, et al. Single-incision laparoscopic excision of pancreatic tumor in children. J Pediatr Surg 2015;50:882-5. Zhang J, Gej T, Wei YD. Single-port laparoscopic surgery for incarcerated indirect inguinal hernia in children. 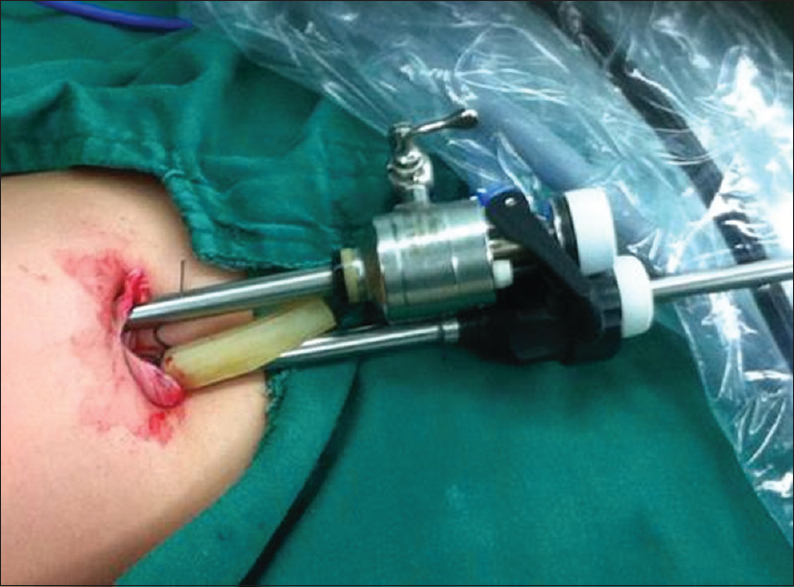 Chin J Minim Invasive Surg 2014;14:769-71. Lang B, Lau H, Lee F. Epigastric hernia and its etiology. Hernia 2002;6:148-50. Korenkov M, Beckers A, Koebke J, Lefering R, Tiling T, Troidl H, et al. Biomechanical and morphological types of the linea alba and its possible role in the pathogenesis of midline incisional hernia. Eur J Surg 2001;167:909-14. Ponten JE, Somers KY, Nienhuijs SW. Pathogenesis of the epigastric hernia. Hernia 2012;16:627-33.